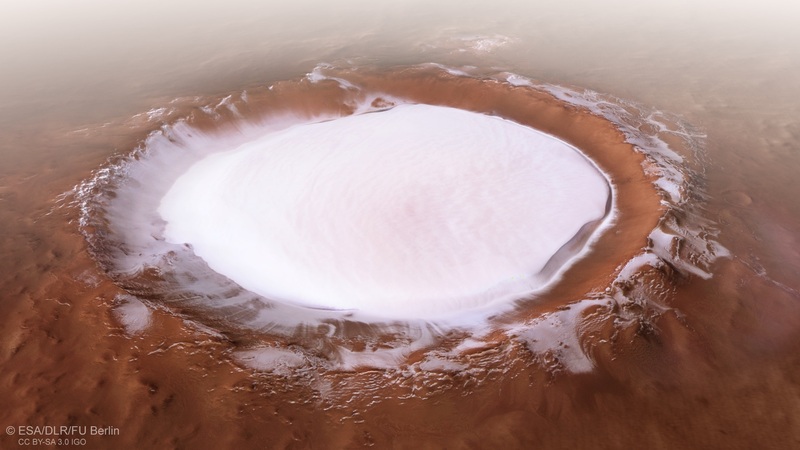 Locked away beneath the surface of Mars are vast quantities of water ice. But the properties of that ice—how pure it is, how deep it goes, what shape it takes—remain a mystery to planetary geologists. Those things matter to mission planners, too: Future visitors to Mars, be they short-term sojourners or long-term settlers, will need to understand the planet’s subsurface ice reserves if they want to mine it for drinking, growing crops, or converting into hydrogen for fuel. Trouble is, dirt, rocks, and other surface-level contaminants make it hard to study the stuff. Mars landers can dig or drill into the first few centimeters of the planet’s surface, and radar can give researchers a sense of what lies tens-of-meters below the surface. But the ice content of the geology in between—the first 20 meters or so—is largely uncharacterized. Fortunately, land erodes. Forget radar and drilling robots: Locate a spot of land laid bare by time, and you have a direct line of sight on Mars’ subterranean layers—and any ice deposited there. Now, scientists have discovered such a site. 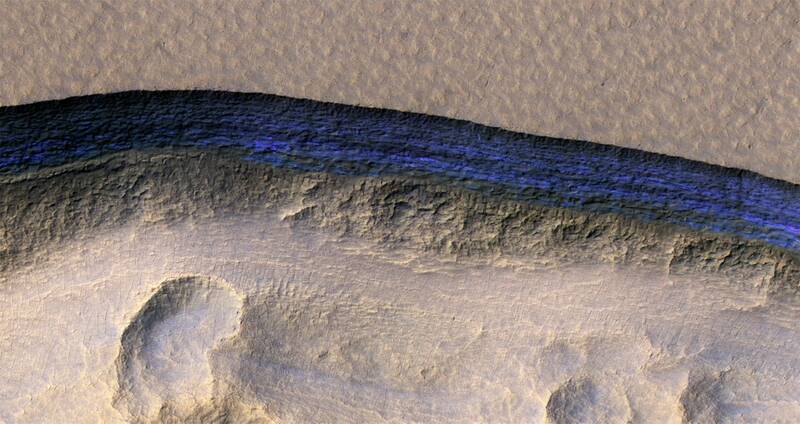 In fact, with the help of HiRISE, a powerful camera aboard NASA’s Mars Reconnaissance Orbiter, they’ve found several. Much of Phobos’ surface is covered with strange linear grooves. New research bolsters that idea the boulders blasted free from Stickney crater (the large depression on the right) carved those iconic grooves. 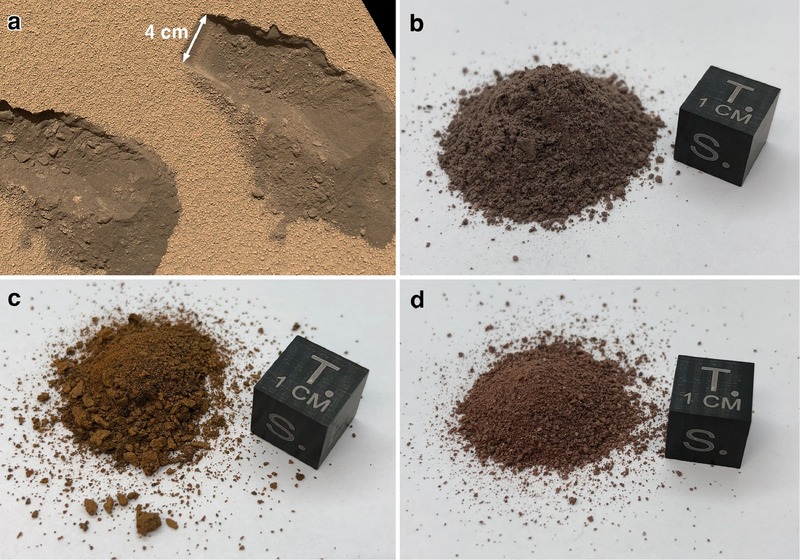 The zip of electricity in Martian dust storms helps to form the huge amounts of perchlorate found in the planet’s soils, according to new research from Washington University in St. Louis. It’s not lightning but another form of electrostatic discharge that packs the key punch in the planet-wide distribution of the reactive chemical, said Alian Wang, research professor in the Department of Earth and Planetary Sciences in Arts & Sciences. The new work is an experimental study that simulates Martian conditions in a laboratory chamber on Earth. Since 13 September, ESA’s Mars Express has been observing the evolution of an elongated cloud formation hovering in the vicinity of the 20 km-high Arsia Mons volcano, close to the planet’s equator. The cloud can be seen in this view taken on 10 October by the Visual Monitoring Camera (VMC) on Mars Express – which has imaged it hundreds of times over the past few weeks – as the white, elongated feature extending 1500 km westward of Arsia Mons. As a comparison, the cone-shaped volcano has a diameter of about 250 km; a view of the region with labels is provided here. 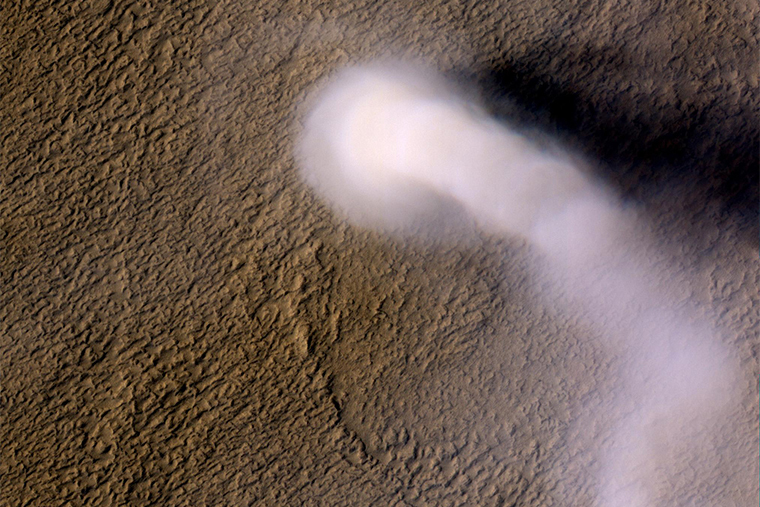 However, a seasonally recurrent water ice cloud, like the one shown in this image, is known to form along the southwest flank of this volcano – it was previously observed by Mars Express and other missions in 2009, 2012 and 2015. InSight Deploys its Instruments: This artist’s concept depicts NASA’s InSight lander after it has deployed its instruments on the Martian surface. Credit: NASA/JPL-Caltech. You don’t need wheels to explore Mars. After touching down in November, NASA’s InSight spacecraft will spread its solar panels, unfold a robotic arm … and stay put. Unlike the space agency’s rovers, InSight is a lander designed to study an entire planet from just one spot. This sedentary science allows InSight to detect geophysical signals deep below the Martian surface, including marsquakes and heat. Scientists will also be able to track radio signals from the stationary spacecraft, which vary based on the wobble in Mars’ rotation. Understanding this wobble could help solve the mystery of whether the planet’s core is solid. A new study suggests that salty water at or near the surface of the red planet could contain enough dissolved O2 to support oxygen-breathing microbes, and even more complex organisms such as sponges. As part of the report, Stamenković and his coauthors also identified which regions of Mars are most likely to contain brines with the greatest amounts of dissolved oxygen. This could help NASA and other space agencies plan where to send landers on future missions, they said. The work was published Monday in Nature Geoscience.